I would like to share this blog from last year as these designs are the collection of the month during August, which means they are only $35. Over the last few weeks I have been working on the new Christmas collection for 2017. This collection was inspired by some wrapping paper! 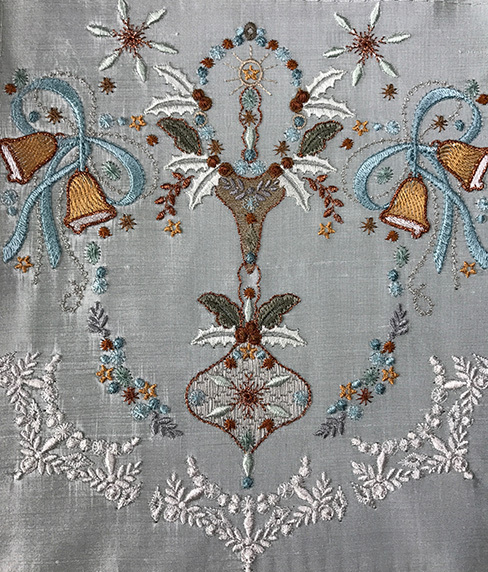 As there are already several collections at Graceful Embroidery in the usual seasonal colour schemes, I have decided to use a very different group of colours, jades, olive greens, greys and rich spicy colours like russet, maples and cinnamon along with copper and silver metallic thread. The development of these designs, takes advantage of the wonderful digitising tools available in Wilcom e4, the latest version of the commercial software that I have been using. The designs have a slight “grunge” feel to them like Amore Grunge, Fleur de Grunge and Morning grunge, characterised by tiny elements and open leaves. 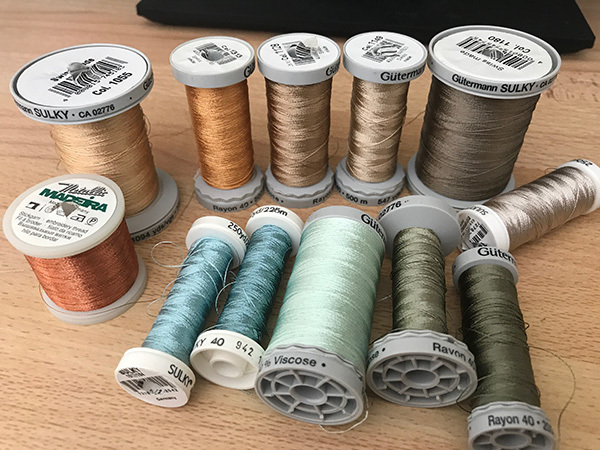 Along with Sulky 30 Metallic silver (7001) and dark copper (7020) for a little sparkle, I have included more double satin stitches in this collection which give a wonderful raised effect without becoming too dense. This works extremely well for the faces of the angels. 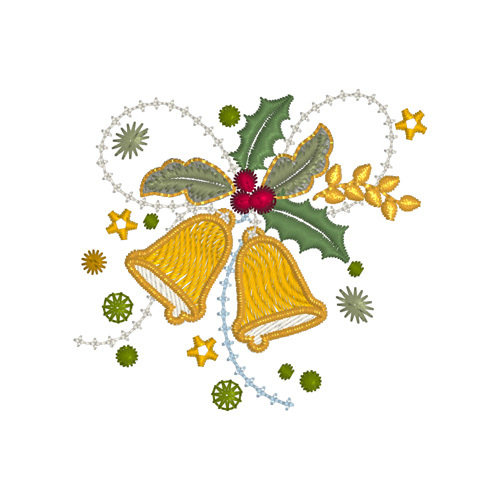 It is always my intention to add lots of options and variety to a collection and it is important too include some borders, panels and corners which can show case the designs when embroidering larger projects. 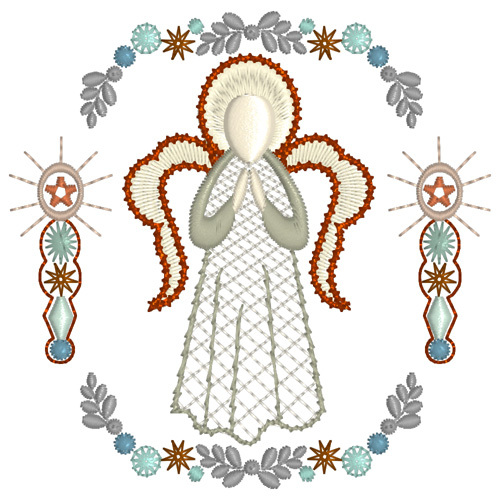 So along with the angels, the various leaves, ribbons, baubles and small elements I have created some pastel designs for contrasting work. 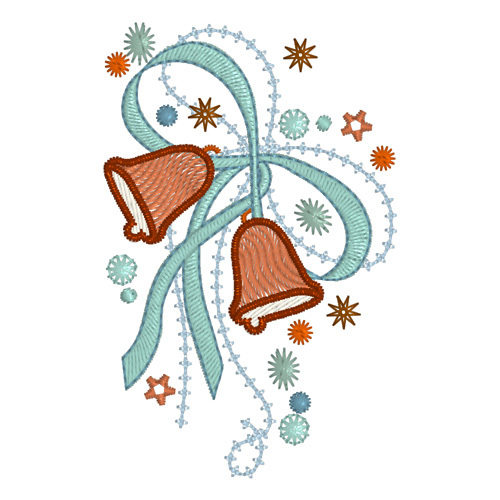 These use very pale colours or they can be successfully stitched out in just one colour. 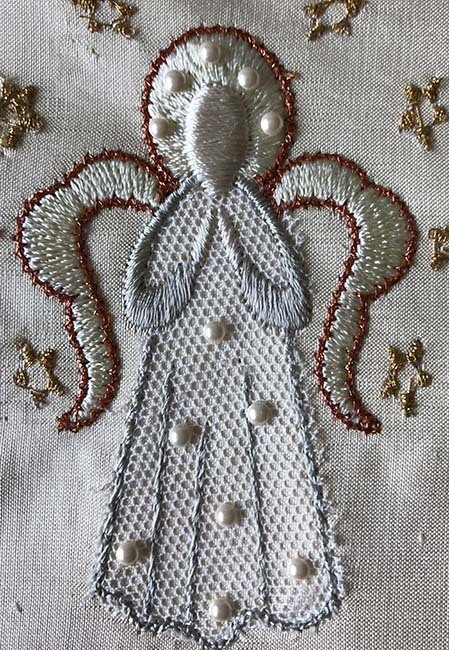 For these designs I suggest the use of maybe some white metallic thread, like Sulky 30 metallic prism white. 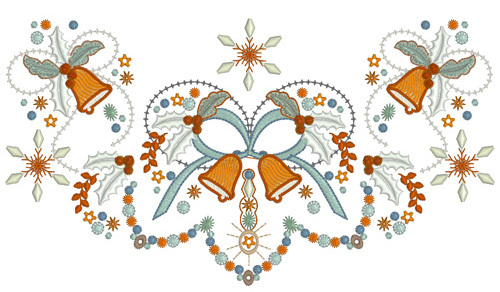 This photo shows a combinations of 2 designs from the first set and how they form a lovely delicate panel. There are several options when it comes to the angels. 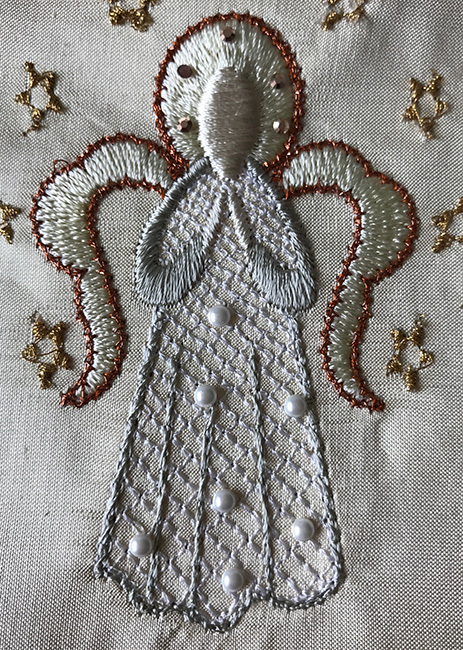 As well as a choice of colours, there are two outlines of the skirt in each design, so an applique can be added easily and here I have used English cotton net and embellished the angel with pearls. Due to her size which only around 3″ high, patterned lace may be too much. 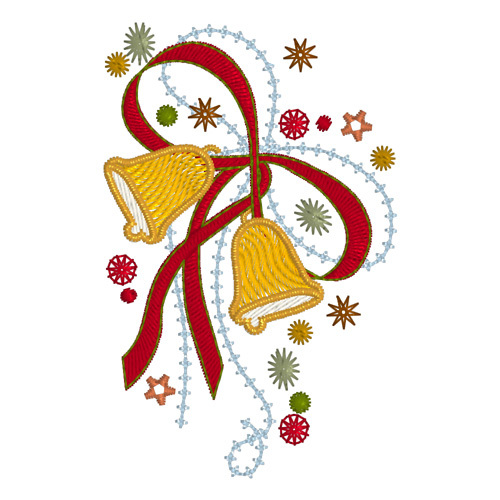 The other option is to use the open fill stitches. 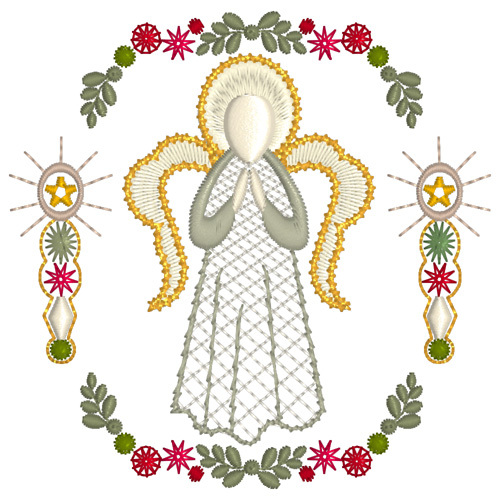 Although I have made this a Christmas collection some of the designs could be used for other types of embroidery without the angels, holly and baubles. For those who prefer to use a green and red colour scheme the detailed PDF gives information on possible conversions. See how the colours effects three of the designs. 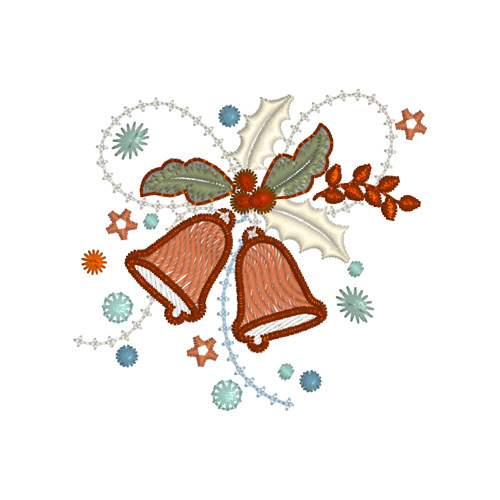 To test the quality of these designs there is a freebie to download from my website. I do hope you love these designs as much as I do. This year I was determined to get my Christmas collection out early so you all had time to create something very special for December. Who knows I may have time to do something else as well! It has been fun creating them and the first set of 28 designs for 4″ x 4″ hoops, will be released today. To view the designs take a peek at this video on YouTube. 3 more sets for larger hoops will follow soon including this one which at the moment is my favourite. 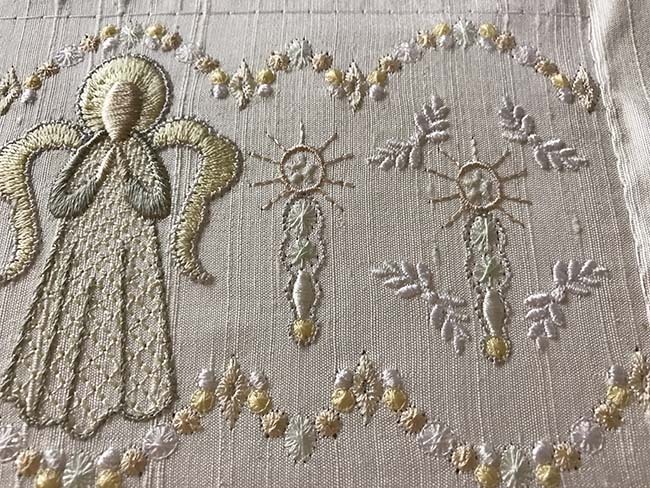 This entry was posted in Discussing machine embroidery. Bookmark the permalink. Hazel, these are lovely and with your colour scheme could be used year round! Well done! These designs are incredible! I love them. But as usual I need more ideas on how to use them and when I watched the video, the design ideas were too faint to easily read. I forgot to mention that the freebie doesn’t show up either. Thank you so much for your work.